*Note: This can not use Dry Battery. KO PROPO re-introduces it's popular stick transmitter platform utilizing today's technologies. A dedicated 2.4GHz FHSS system has been incorporated long with the use of today's popular battery types and EX-1 KIY software technology for easy navigation. 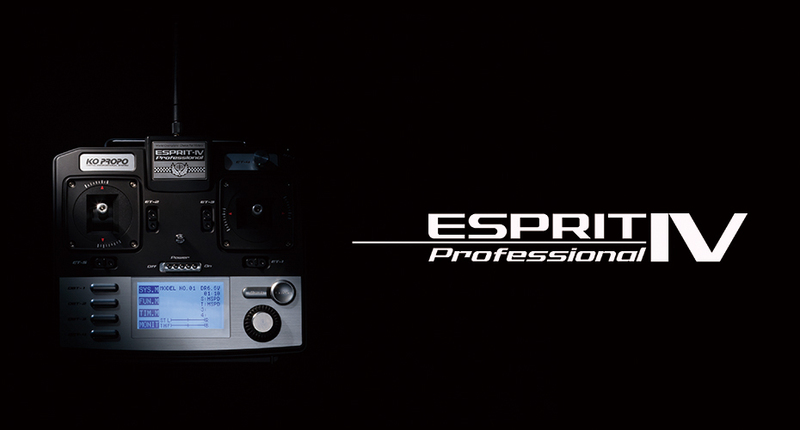 The ease of use with 2.4GHz technology in incorporated into the ESPRIT IV. No more removing modules or looking for available frequencies. Coupled with the KR-413FH receiver, response speeds can reach 2.8ms in the Advanced mode with great linear feel. Today's battery options gives everyone the choice on what they would like to use and feel comfortable with. The ESPRIT IV caters to today's needs and give you the option of using dry (non-rechargable), NiMH (5-cell), LiPo (2S) or LiFe (2S) batteries. Operating times between battery charges or changes has greatly increased. 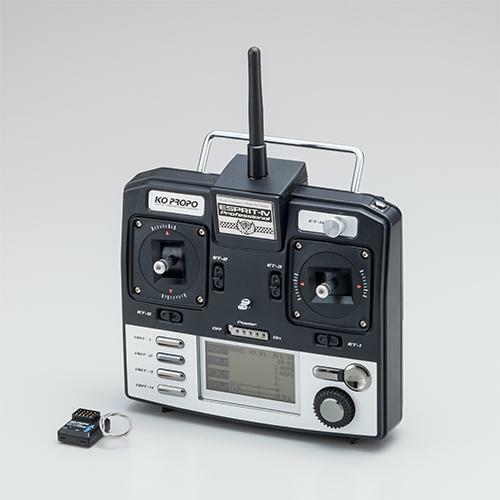 Ease of navigation and functionality was achieved in the EX-1 KIY and this software has been tuned for sticks and incorporated into the ESPRIT IV. Using the jog dial to quickly scroll through the menu or using the direct buttons (short-cut buttons) allows you to get to what you use the most. The large LCD screen gives you plenty of visual representation of the functions and menu layout. The long awaited stick transmitter has made its way back into the KO PROPO line-up with today's technologies.